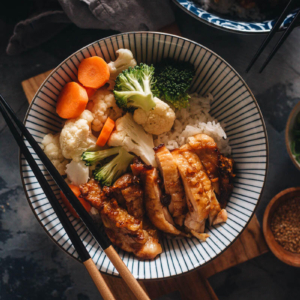 Although Chinese cooking uses both Chinkiang vinegar (also called Chinese black vinegar) and rice vinegar, the former is used more often in authentic Chinese cuisine. Chinkiang vinegar (Zhenjiang vinegar, 镇江香醋) is a type of Chinese black vinegar. It is made from various grains and is aged until the color turns dark brown or inky black. It has a rich, pungent, and tart flavor, sometimes with a hint of sweetness. It has a fermented malty taste and woody character that distinguish it from the light colored and fruity rice vinegar. For most Chinese recipes, if a recipe says to use rice vinegar without specifying the type, it usually means black vinegar. 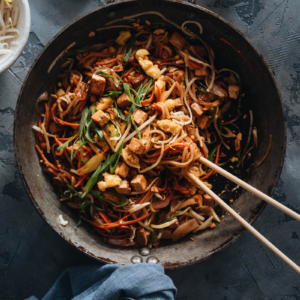 For certain dishes, such as vinaigrette cabbage, Kung Pao chicken and spinach salad, you should only use black vinegar. On the other hand, certain dipping sauce or sweet and sour sauce calls for the lighter color rice vinegar. There are four famous brands of black vinegar in China, all made from different ingredients and have distinct flavors. I usually keep two types of black vinegar in my pantry, Chinkiang vinegar and Shanxi Extra Aged. Chinkiang vinegar is made from glutinous rice and has a well balanced sour flavor and milder than extra aged vinegar. It’s commonly used in southern parts of China, and it is the most commonly used black vinegar outside of China. Shanxi Extra Aged (山西老陈醋, shan xi lao cu), or Shanxi superior mature vinegar, literally means old vinegar in Chinese. It’s made from sorghum, barley and pea. Shanxi vinegar is usually aged for 9 to 12 months. But some superior types are aged for 3 to 10 years. The extra aged vinegar has a very rich flavor and umami, well balanced in sweetness, and taste much more pungent than Chinkiang vinegar. 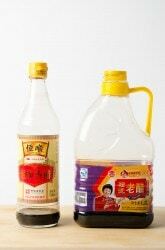 It is the only right type of vinegar to used in noodles for many Chinese people. Tianjin Duliu Vinegar (天津独流醋, tian jin du liu cu), an aged vinegar made from rice and wheat, has a lightly sweet flavor and is less acidic than Chinkiang vinegar. It’s commonly used in northern China and is especially nice for making dumpling dipping sauces and cold appetizers. 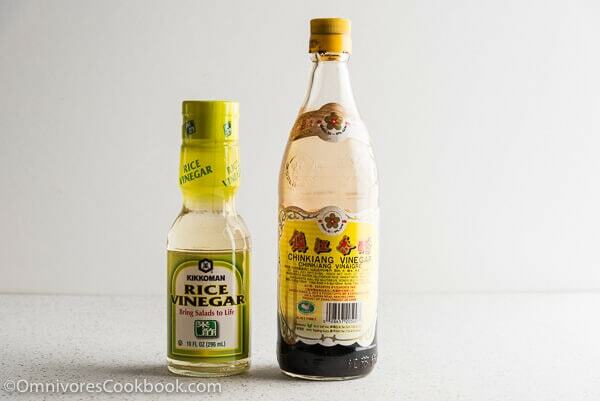 If you are new to Chinese cooking, I recommend you start with Chinkiang vinegar. It has a very standard flavor and can be easily found at a Chinese market. You can also use other types of aged vinegar as alternatives. 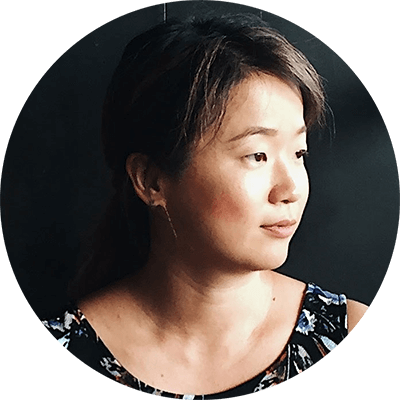 Depending on the brand of black vinegar, its sweetness and sourness will vary a lot. 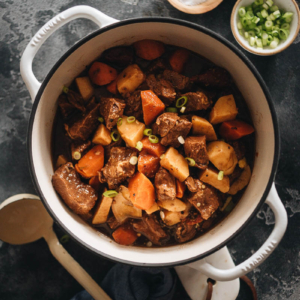 It might result in a slightly different flavor and character for a finished dish, and you will want to add other ingredients (saltiness and sweet) to balance the flavor. You can find Chinkiang vinegar in Chinese market, Asian market, or on Amazon. To get other black vinegar, you might need to try large Asian market or Chinese market. As for the lighter color rice wine, we usually use Japanese brand. You can find it in most Asian market or on Amazon.